IPhone App travel guides are fast overtaking traditional printed guide books. The reasons are obvious, not only are Apps a 'greener' option, but most paper guides, even those produced by the giants, are out of date almost as soon as they are printed. Current App technology coupled with good local ground work and accurate seamless updates means that turning up to a 'closed shop' will soon be a thing of the past. In built satelite tracking and mapping facilities are invaluable in places like Ireland where the road signage is (I am sorry to say) terrible! Nobody wants to waste their precious holiday time or money getting lost (although it can be great fun especially in Ireland) but it's time for us to get with the 21st century! 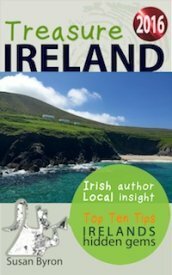 Which is why I have reproduced a lot of the information on this website in iPhone App or eBook format so that visitors will have only the best, most accurate and current information about Ireland, quite literally at your finger tips. You can download the Apps to your iPhone, iPad, iPod or smartphone before you travel, pick and choose the best hotels, restaurants and visitor attractions & then be able to find them easily when you get here? And please, let me know if there is any information missing that you would like to see included in future updates. Is iPhone App is an A-Z of the very best visitor attractions in Ireland ranging from cool castles to exquisite country houses, interesting museums, cultural centres and sacred places. There are bus trips and boat trips and adventures to go on that will add an extra dimension to your experience of Ireland. Being Ireland, there is a smattering of the best breweries and distilleries and a few surprises like the Foynes Flying Boat Museum where Irish Coffee was invented and the brand new Butlers Chocolate experience. 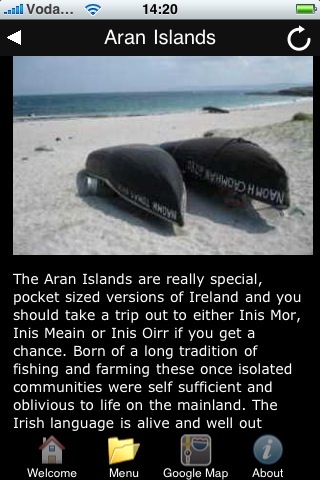 This iPhone App is a free insiders guide to Dublin and my personal take on the city where I was born and reared. In a similar format to the website, it features the Top 10 Visitor Attractions in Dublin (5 of which are Free!) the others are reasonably priced and represent excellent value for money in terms of interest and an authentic experience of the city. Also included are 10 Hidden Gems or other things to do and see at each location that you wont find in any of the standard guidebooks. The Galway City Guide iPhone App features the 10 Best of Everything There is to See and Do in Galway, including hotels, restaurants, pubs, cafes, shops, foodie haunts and much much more. All of these places are on my doorstep so I can quite literally stand over them. Galway is a great town and genuinely as popular with the locals as it is with visitors. It's small, intimate and very friendly all year round, there are great pubs with lots of free music plus lots of other entertainment or shopping options. This iPhone App is designed to give the user a small 'taste' of the what the Ireland Hidden Gems.com website is all about? which you will probably know by now is the Top 10 of Everything there is to See and Do in Ireland. Apart from being independently visited, reviewed and photograph what's unique about the website is the 10 other 'Hidden Gems' for you to explore at each location that you wont find in any other guidebooks. This iPhone app was released in March 2010 as an alternative to all the silly leprechaun apps that were out there? this tells the real story of St Patricks Day in Ireland, the history behind it, how we actually celebrate it and some factual information about Ireland and our culture, including sport, music, dance, food and drink, with a bit of craic, of course!